The “Chelu, We Remember You” Project is a NOCVA initiative that grew out of the historic Chamorro Veterans Commemoration Ceremony that was held in the Nation’s capital on 24 March 2012. 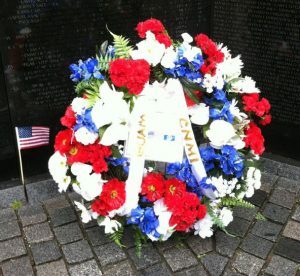 The ceremony honored the 70 fallen heroes from Guam and the Northern Mariana Islands who died during the Vietnam War with a Recitation of Names and a Wreath-Laying at the Vietnam Veterans Memorial Wall. On that day, NOCVA National Coordinators were presented with an extraordinary gift. These rubbings are traditionally made when a visitor to the Wall finds the name of a loved one and wants to remember the experience with a keepsake. Visitors are allowed to place a sheet of paper over the name and rub it with pencil; the rubbing that is created is the exact replica of the name as it appears on the Wall. For many, this is treasured item that keeps the memory of their loved one alive. For family and friends in the islands who cannot easily travel to Washington, DC, obtaining such a memento in person is often difficult or impossible. Therefore, as part of its mission to recognize and honor the service of Chamorro veterans, NOCVA has started to search for the families of our fallen brothers — our chelus. This effort is known as the “Chelu, We Remember You” Project. To assist in this project — either by providing contact information for any of the 70 names or to participate in presenting materials once the family is located — please contact us. *NOCVA recognizes that the list of 70 does not include Chamorros who entered military service outside of Guam; as we receive additional information, they will also be honored in this initiative. *At the time of the Vietnam War, the military recruiting station was located in Guam; therefore, those who enlisted were recorded as having Guam as their home-state-of-record, regardless of whether they were originally from the surrounding islands of Saipan, Rota, or Tinian, now referred to as the Commonwealth of the Northern Mariana Islands.